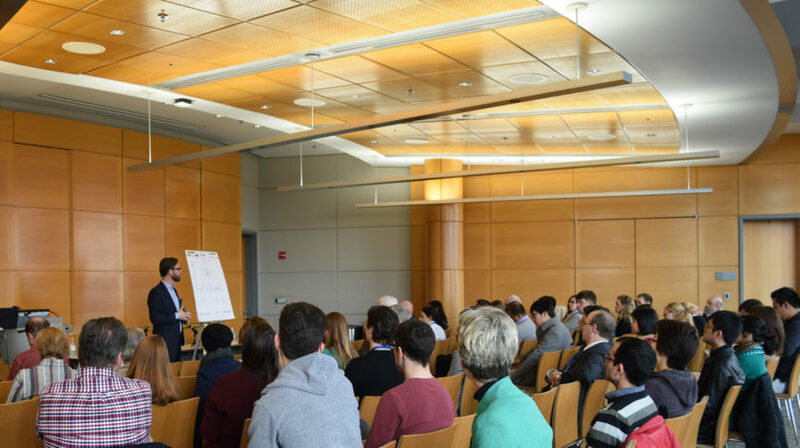 The Wharton Neuroscience Initiative explores the ethical, legal, and societal implications for neuroscience and business at its second annual WiN summit. Nita Farahany traveled to Penn to talk law and ethics as they pertain to neuroscience and business for the 2018 Wharton Neuroscience Initiative Annual Summit. The Duke University professor of law and philosophy was joined by her colleague John Pearson, a research professor at the Duke Institute for Brain Sciences. Fascinating and forward-thinking, in two separate presentations, they detailed decision-making surveys and studies they have recently worked on, setting the stage for an engaging panel discussion that included Penn professors Stephen Morse, from Penn Law School, and Martha Farah, from the Department of Psychology, as well as moderator Diana Robertson, a professor of legal studies and business ethics at the Wharton School. Merging such diverse scholars for a conversation, and sometimes debate, was the goal of the second annual WiN summit: The Ethical, Legal, and Societal Implications for Neuroscience and Business. Throughout the rest of the day, the conference’s nearly 150 attendees also listened in on sessions concerning marketing, consumer choice, and social impact; moral judgment, decision-making, and regulations; neurotechnology, embodied augmentation, and machine learning; and data science and societal implications. Speakers included others from Penn and Duke, as well as Jan Trzaskowski from Copenhagen Business School, Carl Marci from Nielsen Consumer Neuroscience, and Josh Duyan, a Penn alumnus and chief strategy officer at CTRL-labs. Nearly 150 attendees came to Huntsman Hall for the 2nd Annual WiN Summit, which featured a full day of programming with sessions and panels on topics that included challenges to using big data for social good and consumer neuroscience in the age of distraction. For instance, Farahany, a leading scholar on the ethical, legal, and social implications of biosciences and emerging technologies, particularly those related to neuroscience and behavioral genetics, discussed EEG devices, sometimes called “brain wearables,” that detect brain wave activity. The information that can be aggregated — such as tracking sleep patterns, alertness, or wakefulness — can be fascinating, and even life-saving. Believed to help improve distracted minds, some users have included drivers, athletes, and factory workers. In that vein, Morse, who serves as associate director of Penn’s Center for Neuroscience and Society, noted that it is not necessary to have a theoretical understanding of the brain and mind connection. “You just need big enough data,” he said. As a statistician, brain data is what Pearson, from Duke, focuses on most. Trying to predict choices and behavior has always been key for marketers, but improving the way it is done sometimes causes fear for many who worry about manipulation. What is being seen today is new neuroscience with old problems, noted Morse. It’s real-world questions like this that the Wharton Neuroscience Initiative has been routinely trying to address since its launch in the fall of 2016. — This story was adapted from an article by Lauren Hertzler that originally appeared in Penn Today. The Wharton Neuroscience Initiative (WiN) believes new developments in neuroscience can be translated to improve business, drive new discoveries and applications, and enhance the education of future leaders at the nexus of business and brain science. These advances offer the opportunity for enhanced precision not only in marketing and finance, but also in the identification of talent, enhancement of performance, and advancing human potential. Launched in 2016, the initiative’s disciplinary roots lie not only in Wharton, but also in the Perelman School of Medicine, School of Arts and Sciences, Annenberg School of Communications, Engineering School, Veterinary School, and other schools at the University of Pennsylvania. The WiN community is open and diverse, and defined simply by a shared enthusiasm for understanding the roots of human behavior and translating this knowledge into new applications to improve business and society.